Guided by a framework detailing the essential characteristics of a high-performing organization, the leaders of the customer relations department of a Dutch communications firm developed a comprehensive strategy for achieving a record level of customer satisfaction while improving employee morale and commitment to organizational objectives. Realizing the need to improve its processes in order to better serve its customers and meet its financial goals, the leaders of the Customer Relations department at Ziggo, a Dutch provider of media and communications services, turned to the HPO framework, which outlines the characteristics of a high-performing organization, for guidance. Unlike other instruments, this framework details the factors that are essential to high performance, but does not stipulate how to achieve HPO status. Led by a team of HPO consultants, management developed a strategy for empowering employees to attain departmental goals and cultivating teamwork, all while measuring and communicating results. In five years, the department has seen sustainable improvements at the individual, team, and organizational levels, and in its relations with external partners. Although challenges remain to be addressed, employee satisfaction is up, profits have almost doubled, and the once-struggling Customer Relations department has achieved an all-time high customer satisfaction score for its industry of 7.5 out of 10 and has boosted its HPO level by approximately 10 percent. Responsible for all customer contact with Ziggo, the department of customer relations (CR) takes care of invoicing, maintenance and repairs, sales, maintenance of the website, call center activities, and providing other services to customers. Because the merger of the three predecessors to Ziggo did not go smoothly, a great deal of pressure was put on the integration of the networks, administration, and call centers. The results were a huge CR backlog in order processing, poor accessibility, and many problems in connecting to new customer addresses. This led to much bad publicity for Ziggo and created a crisis that only got worse with time. The Customer Relations department was unable to achieve set goals and targets, provided inadequate service, and made far too many mistakes. To stop the downward spiral, in 2008 CR’s new management made a conscious effort to improve processes and accessibility of the call centers by putting extra resources into efforts to address the most urgent short-term issues. In 2009, strong guidance from the management team ensured that CR operations were once again able to satisfy at least basic customer expectations. With this goal achieved, in early 2010 the CR management team formulated plans to continue with the deployed organizational development activities in order to increase the organization’s level of performance from average to high. The management team also decided to apply the HPO Framework to help Customer Relations achieve its goal of becoming a high-performance organization. relationships with external staff affiliated with Ziggo’s partners —mainly used for customer support, collection activities, and installation services at customers’ homes in cases of severe disruptions or heavy customer demand. In the next step, the management team set out its goals. The first was to make the change results-oriented—that is, not only the starting position and the desired end had to be measurable, but also the progress during the transition (Klarner and Raisch, 2013; Raineri, 2011; Schaffer and Thomson, 1992). The second goal was to make sure that the change and communication interventions were of the highest quality so they would be effective among the Customer Relations department’s diverse population and in an environment where the planning for mechanics and call center employees was of overriding importance. Thus, the interventions not only had to be aligned with the environment and experiences of the various employee categories, but also needed to entice them to start delivering a higher level of performance. The third goal was to make the change approach integral, aimed not only at individual employees and managers, but also at teams, the overall Customer Relations department, and its outsourcing partners. How do we identify where we stand now and where we need to go? How do we prove that we are actually changing and are achieving our goal? How can we make managers and employees aware that there is a real need for change? How can we make them aware of the causes of identified bottlenecks? How do we get people in motion? How do we manage the change over a longer period of time? How do we steer the change parallel to “normal” operations? How do we secure the changes and improvements in the organization? How can we involve our outsourcing partners in the intended change? Using the HPO questionnaire, all CR managers and employees scored their department’s performance on the 35 HPO characteristics from 1 (very bad) to 10 (excellent). Subsequently, the scores for the five HPO factors were calculated, analyzed, and depicted in a graph. To be an HPO, an organization needs to have a score of at least 8.5 on all five HPO factors (Waal, 2012a). As Exhibit 2 shows, the Customer Relations department, as expected, was not an HPO. Exhibit 2 also indicates the HPO factors that needed to be strengthened in order to improve the performance in the Customer Relations department. The diagnosis results were discussed with CR’s management team and an arrangement was made to repeat the diagnosis every two years, with limited metering conducted in-between. The intention was to strive for improved HPO scores at each assessment. In addition, the management team set several additional goals that would facilitate monitoring the success of the change effort: improvement in the scores on the monthly customer satisfaction survey and on the bi-yearly employee satisfaction survey, attainment of certificates (such as an ISO certification), prizes awarded (such as “the best website of the Netherlands”), and evidence of public recognition of the quality of Ziggo Customer Relations (such as praise for the department’s support to customers with payment problems). The realization of these goals, together with the attainment of additional targets from existing improvement programs, was entered on a CR Change Scorecard (see Exhibit 3). 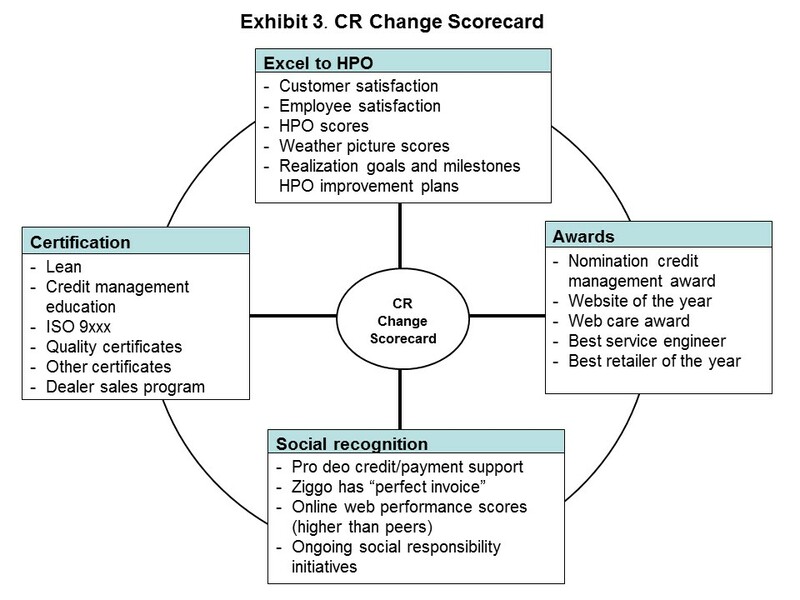 With the aid of this scorecard, managers were able to monitor the transition to HPO according to several change dimensions and subsequently discuss progress weekly during the management team meeting, so change and communication interventions could be accelerated, delayed, or adjusted as needed. Multiple communication interventions were devised to inform employees about the change program and to involve them in the transition to being part of an HPO. These interventions included regular HPO update mailings from the management team; short movies made by employees about the various change interventions on the work floor; annual regional meetings about the HPO transition; brief opinion polls via e-mail on the effectiveness of the HPO transition and the change and communication interventions; lunches with a management team member during which the HPO transition was discussed; and publication of the CR Year Plan, which described the activities for the coming year. Finally an external program manager was appointed to guide the change process, safeguard the integral character of the transition, and prevent operational issues from hampering the transition to HPO status. 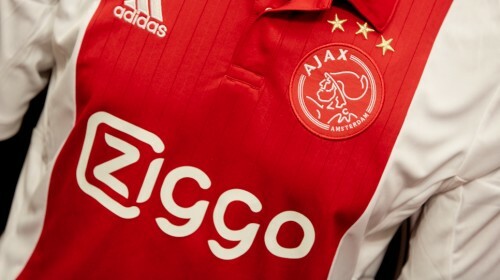 The CR staff was composed of 120 teams, split among five regions in the Netherlands. Inspired by Theory U (Scharmer, 2009) — which proposes that the quality of the results that are created in any kind of social system is a function of the quality of the awareness, attention, or consciousness of the participants in that system — the management team organized an awareness session for each team. In these sessions, root cause analyses were made of the issues that surfaced in the HPO diagnosis as a first step in devising effective solutions. The goal of the sessions was to open participants’ minds, hearts, and wills regarding the HPO transition (Scharmer, 2009). Since the HPO framework is aimed at the organizational level, management decided to use an alternative instrument on the team level, the Perspective/Macrolook meter (Hatchfund Nederland, 2009a). Through questionnaires and “weather icons” (“Is it raining on our team, is the sun shining, or is it cloudy?”) employees indicated how they felt about the Customer Relations department and their particular team and whether they thought they could realize their ambitions with their current competences. During the awareness sessions, the results of the HPO diagnosis and the Perspectives and weather icons tests were presented and discussed with the employees. Subsequently, 120 Call2Action sessions, one per team, were conducted in which the employees drafted a team development plan of improvement activities for their team. Any suggestions that transcended the team level were passed on to the managers to present higher up the organization for action. Each quarter, the teams conducted review and preview sessions in which they looked back at what they had achieved in the past three months (review) and looked ahead at activities that they needed to perform in the current quarter (preview). This close monitoring of each team’s progress helped keep them on track and enabled them to make any needed adjustments to their respective development plans. The Real Drives test (Hatchfund, 2009b) and the Reflector assessment (a 360-degree assessment specifically developed for Ziggo) were used to bring the CR managers to HPO level. A large part of the latter instrument was based on the High-Performance Manager profile developed by Waal et al. (2012). All the managers completed the Real Drives test themselves and then had their employees and colleagues fill in the Reflector test on them. The managers then used the results from both tests to draft their own personal development plan. Subsequently, they were offered HPO “leadership learning impulses” — monthly courses on specific leadership characteristics needed to reach HPO-level performance — supplemented with organization-wide Ziggo management development programs. Every year the managers held “portfolio conversations,” in which they shared their test results and their progress on their personal development plans with their employees, colleagues, and their own manager. The Ziggo Customer Relations department also invested heavily in the development of its rank-and-file employees. The aim here was to teach them specific HPO competences, such as being able to better cooperate, become more results-oriented, and be more flexible (Waal and Oudshoorn, 2012). Overall, the goal was to increase employees’ motivation to continuously strive for improvement. All employees were given the opportunity to fill in an HPO self-assessment and, with the results of this test in hand, were able to choose from monthly HPO learning impulses and CR-wide employee development programs. Employees were also encouraged to visit other departments and to make contacts there in order to more easily improve processes that crossed team and departmental borders. This “peeking at the neighbors” stimulated self-initiative, increased mutual understanding, and reduced cultural differences between teams. Parallel to these employee development efforts, their managers were taught how to better coach employees during their development and continuous improvement efforts. At the end of the year, employees held a “development conversation” with their managers in which they shared the results of their self-test, development plan, personal goals, and examples of actual improvement efforts. The Ziggo Customer Relations department had many strategic partners who provided temporary staff, executed activities when there was an extra high production demand, or supported the implementation of new products and services. CR’s management team decided that these partners, who collectively made up almost 30 percent of CR’s workforce, should also participate in the transition to HPO. In this way, customers would receive an equally high caliber of service, regardless of whether it was provided by a CR employee or by an employee of one of the department’s partners. Specific strategic partners were asked to participate in a High-Performance Partnership (HPP) program, which consisted of an objective evaluation of the quality of the partnership from the perspective of both CR and the partner (Waal et al., 2013). Special attention was given to the degree of openness, the balance of power, and conflict management in the partnership. The HPP diagnosis was followed by workshops in which CR and its strategic partners shared the results and their opinions about each other and jointly drafted improvement plans for the partnership. After this, both parties agreed to conduct quarterly review and preview sessions to monitor and safeguard the quality of the partnership. Exhibit 4 provides a chronological overview of the change and improvement interventions that took place in the Ziggo Customer Relations department between 2009 and 2013. 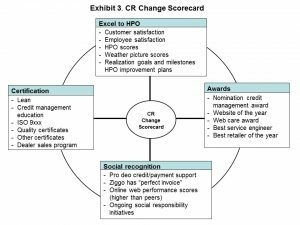 As previously noted, evaluating the impact of specific change and communication initiatives (as described in Exhibit 1) on the various target groups in the Customer Relations department was one of the goals of the change program. A questionnaire was distributed to the CR managers and employees in order to assess these effects (Heijtel, 2012). For each intervention, respondents were asked to indicate whether it had been effective in helping them feel more closely involved in and committed to the HPO transition and whether the intervention had enticed them to improve their performance. The scores were converted into percentages of respondents who experienced a positive effect of a specific intervention. When an intervention scored less than 60 percent, it was deemed to be ineffective. An intervention scoring between 60 and 80 percent was seen as effective, while an intervention scoring higher than 80 percent was earmarked as highly effective. Exhibit 5 provides an overview of the effectiveness of the change and communication interventions in the Ziggo Customer Relations department. The effects of the interventions in the HPP program and of long-term interventions (manager and employee development programs) are not included among these findings for they had not yet been measured as of this writing. Exhibit 5 provides an overview of the effectiveness of the change and communication interventions in the Ziggo Customer Relations department. As Exhibit 5 shows, 80 percent of the interventions were effective to highly effective. The analysis showed that managers were the most positively affected, probably because most of the interventions had been aimed at them. This is in line with the HPO framework, in which the Management Quality factor, which is composed of 12 of the 35 HPO characteristics, plays a predominant role. This explains the need for multiple interventions to strengthen this factor. Most of the changes that turned out to be not very effective primarily concerned individual interventions: visiting the special HPO page on Ziggo’s Intranet, maintaining logs and target books, and individual employee interviews conducted by peers. The very effective change interventions were those that took place in teams and groups of people and that encouraged dialogue: the awareness sessions, the Call2Action sessions, and the management days. Although the Real Drives intervention was aimed at individuals, the results of the test were discussed with the respective team, which essentially rendered it a group intervention. This also is in line with the HPO framework, in which the Openness and Action Orientation factor advocates for frequent dialogue. A renewed sense of employee pride in themselves. During the crisis, employees were continuously confronted with complaints and well aware of their department’s poor performance, but powerless to better the situation. During the HPO transition, they realized that they were indeed capable of delivering good performance and that they each could play a part in remedying problems, both individually and as members of well-functioning teams. Regular measurement and communication of the results significantly contributed to the restoration of employees’ sense of pride and ownership of results. A widespread feeling of trust. CR staff were empowered to identify bottlenecks in their area of influence, draft improvement plans for these, and then execute these plans themselves or with their team. The realization that management trusted in their abilities inspired them to energetically tackle issues of concern. The training and development efforts that were deployed to strengthen individuals and teams uncovered much hidden talent in the organization, especially among repair personnel and call center staff who traditionally had been regarded as having limited development potential. The development efforts encouraged many “to rise above themselves,” and their managers did a good job in encouraging them to do so. A sense of belonging to a worthwhile organization. Plenary and national “GoHPO sessions,” which kicked off the execution of the HPO improvement efforts, contributed to a shared sense of belonging among the CR staff. They now realized that they were part of a bigger entity— an organization that was becoming increasingly successful—and that they were able and also expected to contribute to its success. During these meetings, progress and improvements were reported, successes were celebrated, and “HPO heroes” were recognized. All these developments helped staff realize that management was serious about the changes being implemented to make the Customer Relations department an HPO, and that the initiative was not a one-off event but a long-term program that opened up opportunities for the organization as a whole and for each of its members. Now, nearly six years after the start of the transition to HPO in the Ziggo Customer Relations department, it is possible to unequivocally conclude that the change approach achieved its intended effects. The results of the CR scorecard show that sustainable improvements have been made on individual, team, and organizational levels, and that cooperation with partners has significantly improved. This translated into CR achieving an all-time high customer satisfaction score for its industry of 7.5 out of 10. In a relatively short period of time, the organization was able to boost its HPO level by approximately 10 percent (see Exhibit 2). The HPO framework offered managers and employees an accessible vocabulary to help them clearly speak about their daily work life and continuous improvement efforts. More than 70 percent of the goals listed in the Customer Relations department’s improvement plans have been realized, the development level of the teams has increased significantly, and employee satisfaction scores increased by 13 percent. Employees believe that they have been given more leeway to handle their responsibilities, they have shown a greater willingness to change, they feel more personally invested in the ups and downs of the Customer Relations department, and are proud to be working there. The CR teams cooperate more easily, and the HPO framework provides them with a clear-cut standard of working. This has translated into improved financial performance: Between 2009 and 2013, Ziggo’s profits almost doubled. Not everything went according to plan, however. The attainment of several prizes, certifications, and other forms of recognition have not been realized, primarily because internal changes required a great deal of energy, often at the expense of attention to external audiences. In addition, the 10-percent increase in customer satisfaction has not yet fully translated into financial performance and the Customer Relations department needs to ensure that this high level of satisfaction becomes the norm rather than the exception. To this end, CR has begun a quarterly “Passion for the Customer” improvement initiative in which a CR employee who has received customer feedback for having delivered exceptional service is rewarded with a plaque and a gift (Waal and Heijden, 2013). The next step for the Ziggo Customer Relations department is to evolve from its current status as an increasingly better performing organization into a stable and robust HPO. This is a challenge, but now that the CR managers and employees know what changing entails, how intended results have to be made measurable, and which types of change and communication interventions work best, this certainly is not an impossible task. 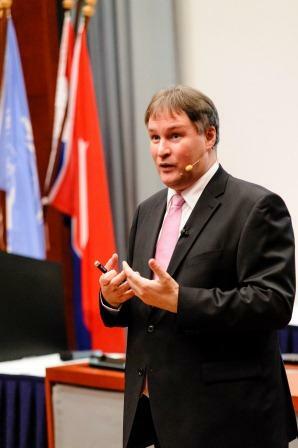 André de Waal is an associate professor of strategic performance management at Maastricht School of Management, the Netherlands, and the academic director of the HPO Center in Hilversum, the Netherlands (www.hpocenter.com). An advisor during the HPO transition at Ziggo, he is the author of 27 books and more than 300 articles in the field of high performance, excellence, and strategic performance management. His latest book is What Makes a High-Performance Organization: Five Validated Factors of Competitive Performance That Apply Worldwide (Global Professional Publishing, 2012). He can be reached at dewaal@hpocenter.com. Eric Mooijman, a partner with Vitrum Consulting in Hardewijk, the Netherlands, was a program manager and consultant during the HPO transition at Ziggo. A specialist in designing and implementing organizational development programs, he is the author of Strategisch Opleiden en Leren in Organisaties [Strategic Training and Learning in Organizations], published by Noordhoff Uitgevers in 2010, and Leren én Veranderen: Een Nieuwe Kijk op Organisatieverandering [Learning and Change: A New Look at Organizational Change], published by Kluwer in 2003. He can be reached at emooijman@vitrum.nl. Martine Ferment is the owner of Ferment Consulting in Nieuwegein, the Netherlands. From 2008 to 2012, she was vice president of Customer Relations at Ziggo, where she initiated and sponsored the HPO transition and spearheaded the execution of the change interventions. Ms. Ferment is the author of two books on customer service, Net Promoter Score® (Customer Interaction Research Center, kirc.nl, Nieuwegein, 2012) and The Future of Customer Interactions: Towards High-Performance Customer Service (kirc.nl, 2011). She can be reached at martine@fermentmanagement.nl.